A message from Tohoku University's President Hideo Ohno. Since its establishment in 1907, Tohoku University has established itself as an academic leader, producing a number of achievements under the spirit of Research First, the philosophy of Open Doors and the policy of Practice Oriented Research and Education. Globalization and the rapid spread of new technologies, such as artificial Intelligence, have led to radical changes in the world's social and economic structures. As the 22nd president, I will do my best to ensure that Tohoku University meets the challenges of those changes by driving creativity, innovation, exploration and discovery. The former president Susumu Satomi, who was appointed in 2012 after the Great East Japan Earthquake, not only stabilized and united a campus community rocked by disaster, he put in motion plans to grow. A great example of that is the new campus extension we now have at Aobayama. 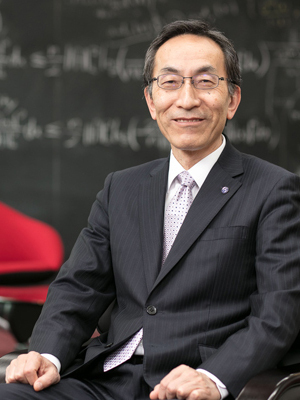 I want to continue that growth, to make Tohoku University an institution that is universally respected for the quality of our research and educational standards. Our most powerful tools are already here - our students, our researchers, our staff and the people in our community - and we will continue to develop human resources and nurture young talent who can break new barriers in research and contribute effectively on the world stage. Last year, Tohoku University was among the first to be selected as a Designated National University by the Japanese government. This new status has given us the independence to develop more ties with third parties and establish other sources of income, which we will use to further improve our capabilities in research and education. I believe that this positive cycle will be beneficial to both the university and the local and global communities we aim to help. Tohoku University has been doing extraordinary things for over a century. With everyone's support, I'm confident we can aim even higher and achieve even more in the coming years.